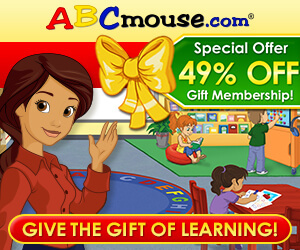 You can get an annual subscription for ABCmouse at a sweet 49% off! ABCmouse is an award-winning educational site that provides full, US-based online curriculum for children ages 2 to 8. With more than 850 lessons and 9000 standards-based learning activities, your child can have fun reading books, playing games, solving puzzles, watching videos, singing fun holiday songs, and coloring pictures while learning one thing or two in the process. Your child can even visit the site's virtual, interactive zoo and farm. In celebration of the upcoming holiday season, you can now get an annual subscription for ABCmouse at a sweet 49% off for your young cousins, nieces or sons and daughters. Gift certificates can be printed out or if you prefer the digital route, you can email a digital gift code as a present instead. Don't wait until the very last minute to buy your Christmas gifts - Give the young ones in the family the Gift of Learning for the holiday season today!